This recipe for french toast pancakes with cinnamon butter and fresh berries was created as part of a sponsored partnership with Krusteaz. So if you’re anything like me, you love pancakes for breakfast, but you don’t make them all the time because you really want to start most days with a good source of protein. But, what if you could have both? I’m not talking about pancakes with a side of protein. I’m talking about pancakes that are the protein! Krusteaz recently introduced new buttermilk protein pancake mix, and I used it to make these french toast pancakes with cinnamon butter and fresh berries. The idea came to me because I despise “eggy” flavored french toast and I needed a solution… so when I found out Krusteaz had made a pancake mix with a big ole protein boost, the cogs in my brain started clicking away and I wondered if I could make such a thing as french toast pancakes. So I replaced the egg dunking with pancake mix dunking, and got to griddling. Then I added cinnamon butter, fresh fruit and maple syrup, and took a bite. You might have to taste it to believe it, so get the recipe here, make up a batch and let me know what you think! I’ve had enough soggy/eggy French toast to know that I am going to love this! I have not had french toast for years. This would be a nice item to have for Sunday brunch. I LOVE strawberries on top of most anything. This is a lovely way to make French toast, I am sure we will love it. Hope to try out over the weekend. Totally my type of french toast, as too much egg mixture often ruins the experience. I also need that cinnamon butter in my life! I usually have waffles with fresh fruit – never thought to put fresh fruit on my French Toast. Sounds like a delicious combination. I haven’t made French Toast in ages. I would love to have a plate of this when I wake up. Looks like a filling breakfast! I still haven’t mastered French Toast! I am going to have to try it out this way! It looks amazing! I had to pin this! 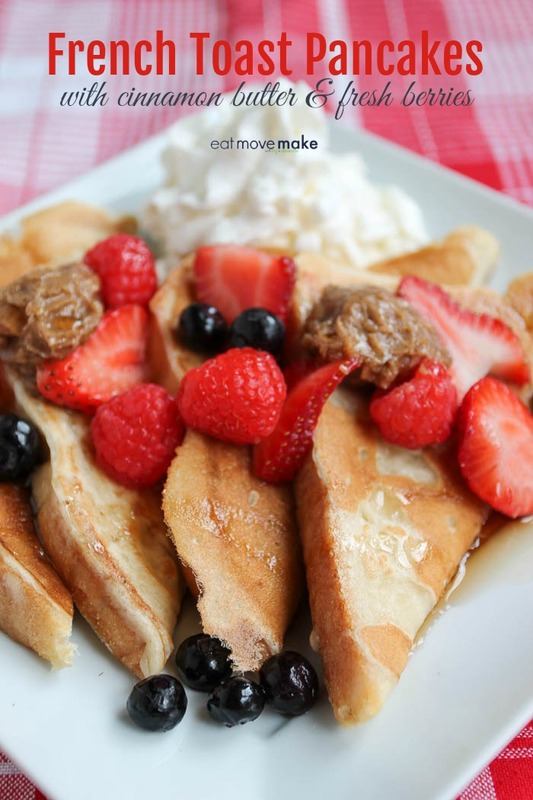 I love french toast and pancakes so this is genius great brunch idea! This looks amazing! My kids will wake up early for this!! This sounds so good! I love pancakes of any kind but I also love french toast! This would be an awesome combination! I love the Krusteaz brand! This sounds and looks like a delicious recipe! I would love to try making this sometime. I would totally love to get some protein in eating these! They look delicious! French Toast is my favorite breakfast food. Your photos look amazing! Thanks for sharing a recipe. I may give this a try soon. These sound amazing! My kids love when I cook new breakfast recipes on the weekend. Gonna have to make them this one. This recipe is genius. I’m totally with you on the (no) eggy French Toast. This buttermilk mix sounds great too! YES! I hate the egginess too. But I love cinnamon so I always just dealt with it. Your French Toast Pancakes are going to rock our breakfast. Yum, I love Krusteaz brand. We use their pancake and waffle mix. And french toast recipes are my favorite go-to breakfast love! That sounds like the perfect breakfast! I love that Krusteaz has a new mix that already has protein in it! It’s perfect! I love the french toast recipe that you shared too! This is genius! I love french toast but don’t always like that eggy smell or taste. I looks so good. In use the Krusteaz brand already. I love anything with cinnamon. This sounds like a party in your mouth. What an amazing idea. I don’t care for the strong egg flavor with French Toast. This is a brilliant substitute. Now this is a breakfast I can really sink my teeth into! I love anything that is french toasty like. Cinnamon butter sounds amazing! I would love to try this recipe! 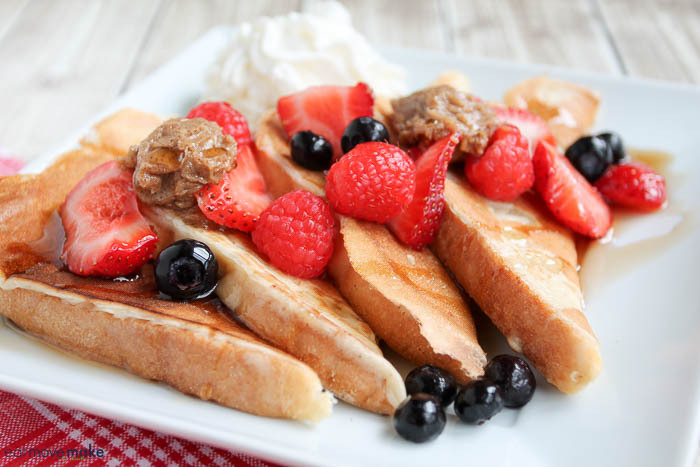 I always like serving my French toast with fruits especially berries! The flavors are perfect for Fall! I am always looking for new breakfast ideas to make. 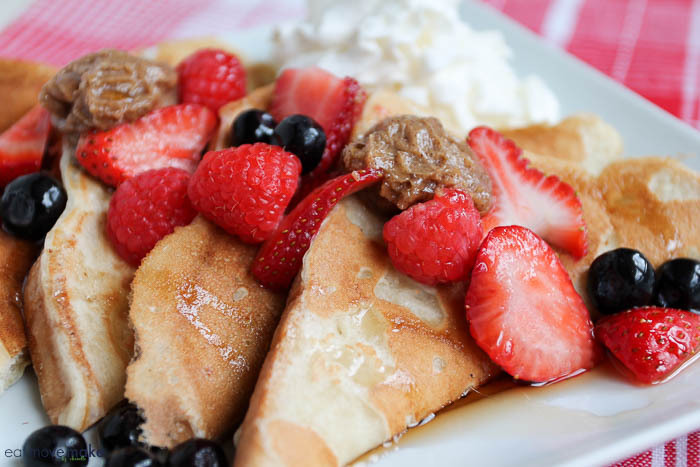 These french toast pancakes with cinnamon butter and fresh berries look amazing. I am excited to surprise the kids on the weekend with some. French toast is my favorite! I am so going to make this recipe! That looks so good. French toast is one of my favorites, so to make it this way would be amazing. I can’t wait to try it out. French toast — pancakes — and then you add cinnamon butter. I am all in! This recipe looks delicious! My kids love the taste of french toast sticks but I never tried to make them from scratch. THis recipe sounds easy and delicious too. I will add this to our weekend menu. Oh these look A-MAZING! My kids would love these. And I love that cinnamon butter! Um, yum. I love French toast and I love pancakes. Combining the two is such a good move. Oh wow. Looks like a power breakfast for me! I need to try making this asap. I love the idea of dipping the bread in pancake mix instead of eggs and milk. I am sure my family will love this too. Thanks for the idea. This looks like breakfast wrapped in heaven. My family is getting this weekend. I am sure they will love it. That looks so delicious! Seeing how much I love cinnamon I’m going to definitely give this a try. I bet this is a breakfast favorite at your house! What a delicious idea! My son loves breakfast, and I have to admit we have it for dinner a lot. He would go crazy for this recipe. We will definitely be trying this! Yummy! You have awesome ideas! I love so much the french toast! And with berries it’s so much better! I love the idea of replacing the egg wash with a pancake batter dip! Now I’m hungry for these! Oh, and with BACON! This is a new and different type of breakfast we haven’t tried before. Will be changing that this coming weekend. I so want you to cook me some breakfast! This looks like the most delicious french toast pancakes EVER in the whole wide world. I love it. The fresh berries on top just slayed this. I have never thought of doing a pancake version of french toast! Brilliant! This is definitely a recipe I will need to try. Very interesting. Sounds tasty. I agree with you on the “eggy” taste. I like your french toast version better. Looks a whole lot better too. The fruits and cinnamon butter made it really delicious. This is a must try for me! This sounds delicious. Two great breakfast foods combined to make a delicious meal. Totally love this. It even LOOKS yummy to the point of making me want to make some right now. This is such a good idea, I never would have thought to combine french toast and pancakes in one dish! I’m going to have to try this for my next weekend brunch. I love french toast but it’s a pain to make. I will check out the recipe and hope that this is easier! Oh my goodness yes please! I have never have french toast pancakes before, how have they not been in my life for so long! I must try them. This sounds like such a delicious decadent breakfast. Perfect for our anniversary coming up! Maybe ill surprise the hubs! I always have a hard time making French toast. For some reason it just doesn’t turn out right. I’m excited to try this one and see if for once I can get French toast to come out delicious. This definitely looks delicious. I wish I had bread so that I could make this right now! I love cinnamon on my French toast. This sounds super yummy and I bet they smell good too! I love french toast and using pancakes instead of bread was a very creative idea. Yes please! I LOVE French toast–and there’s cinnamon butter? Ooo I’d be in heaven. I’ll be making these soon! This is right up my alley! I usually avoid french toast because I can’t stand that “eggy” taste. Finally, I can have my french toast and protein without that overpowering eggy taste. Yum! That cinnamon butter sounds magical. I am super excited to make these for brinner this week.